Refinements bring the PowerWatch 2 nearly to parity with other smartwatches alongside its miraculous ever-charged tech, but the list price is likely too high for many consumers. Last year, the startup Matrix Industries released the PowerWatch and PowerWatch X, smartwatches with an audacious feature: so long as it stays on your wrist, it never needs to be recharged. A thermodynamic generator kept the wearable powered from your body heat. Unfortunately, the rest of the watch left something to be desired, with missing features like GPS and a heart rate sensor that had become commonplace on most smartwatches. Without much functionality, it was reduced to a miraculous step counter. Matrix is ready for round two with the PowerWatch 2, and they’ve packed in most of the glaring omissions from the original (plus a few cool extras). In other words, it’s everything the original should have been, but it still won’t outfunction an Apple Watch. Does that matter? It’s a huge question: the smartwatch market has essentially split between high-end devices like the Apple Watch 4 and Samsung Galaxy Watch and less-expensive models like the Huawei Watch GT and TicWatch E. At $499, the PowerWatch 2 is solidly priced in the former category. Yet it doesn’t have the app suite that Apple or Android devices have, and probably won’t get them given that Matrix’s new smartwatch runs on a custom OS (more on that later). Instead, the PowerWatch 2 sits in the much more niche field, a third type of smartwatch appealing to those searching for tough devices they don’t want to worry over. Among the first PowerWatch’s more avid users were ex-military and outdoorsy folk – those who enjoyed its never-dying technology yet fervently requested more features. So while the PowerWatch 2’s capabilities haven’t reached parity with the Apple Watch, it will track your fitness and perform a few of the more complex functions of your average flagship smartwatch – and you’ll never, ever have to charge it. Matrix made sure of it by adding a secondary charging system: a solar strip in a ring along the outer edge of the display. The company assured me this addition is redundant, since not one of the original PowerWatch’s users complained that the thermodynamic generator didn’t keep the watch going. Instead, they explained, it alleviates users’ battery anxiety – the feeling that their PowerWatches might run out of battery. It’s one of several adjustments Matrix made to endear their second device to users’ tastes and expectations. The PowerWatch 2 has been slimmed down to 42mm wide, down from 50mm of the PowerWatch X, with the same rugged look and feel of the latter: metal black casing, texture-patterned buttons and red trim. The Matrix team noted that they may release models with trim in other colors. The standard-issue rubber-feeling watch bands return, though the frame accepts any standard pin-based bands. Similarities aside, the stiff right-side-mounted crown from the first watch has been removed in favor of an additional pair of buttons. This enhances functionality – all four buttons can be customized as shortcuts – and makes the watch symmetrical, which means it can be used equally easily on either wrist. Aside from having color this time around, the new display is notably sharper, and makes the watch look like less of a prototype and more appealing to the typical consumer. But they would have to get used to the device's low-power 1.2-inch LCD screen: unlike the typical bright smartwatch, the PowerWatch 2 relies on reflected sunlight to reduce battery drain. While I didn’t see it, Matrix assured me the final model will have a backlight for nighttime viewing. The watch also has gesture control and audio/haptic feedback, both standard on today’s smartwatches. A couple other expected features – always-on GPS and a heart rate monitor – have been included in the PowerWatch 2, which were sorely missed by adopters of the first watches. Adding these has thickened the wearable to 15mm, which is somewhat bigger than the Apple Watch 4’s 10.7mm thickness, but it's by no means hefty or cumbersome to wear. To make room, the Matrix team halved the size of the thermoelectric generator from that in the first watch. Speaking of the tech at the heart of the device, it technically generates more power in cold environments, where the difference between skin temperature and outside air is greater. But there only needs to be one degree separating external body temp from the outdoors for the watch to keep going, Matrix’s developers said. Left on its own, the watch can last two years in rest mode. In summary, the PowerWatch 2's design reflects its purpose and use-case – just don't expect anything more. There are still some features available on leading smartwatches, like contactless payment, that are absent in Matrix’s next wearable. But if you're hunting for a serious trail-running or camping fitness wearable with a modicum of connectable features, this wearable will probably answer your prayers. It's even water-resistant up to 200 meters. What might make the PowerWatch 2 a harder sell to the average consumer is the lack of apps and software compared to the Apple Watch 4 and leading Android-powered smartwatches. 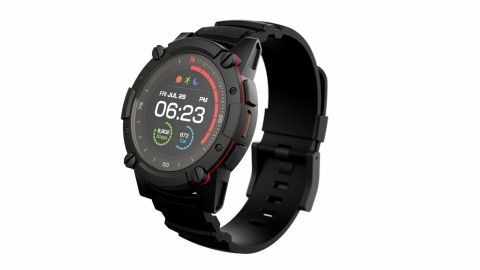 While it will run Strava, Google Fit and Apple HealthKit out of the box, Matrix said, the entire watch runs on a custom OS – which was necessary to ensure it doesn’t drain more battery than the PowerWatch 2 generates. In fact, many of the watch’s internals were custom-made by Matrix to ensure its minimal power sipping. It’s unclear if this will pose problems for developers creating apps for the wearable. In any case, the PowerWatch 2 will have iOS and Android apps paired to the device. Setting those up should be easier this time around, with a QR code users scan through the app to swiftly pair device and wearable. On its own, the watch tracks a variety of fitness metrics: heart rate, GPS, distance, steps, sleep and even how much power your body produces through the thermoelectric generator. If nothing else, it's one of the most robust fitness trackers on the market – one you'll never have to worry about charging before a workout. As someone who loves taking their watch anywhere (and not wanting to worry if it takes a few hard hits), I'm a fan of the PowerWatch 2's always-charged tech and rugged look. But it’s hard to gauge whether the wearable from a lesser-known brand will appeal to a broad range of consumers, especially those who have grown attached to the fashionable look of the Apple Watch (not to mention bragging rights of owning a chic Apple accessory). The PowerWatch 2 will retail for $499, which is likely out of some consumers' price ranges. Fortunately, Matrix is launching an Indiegogo campaign which will have early bird prices starting at $200, but who knows how many units will be available at this price point. Regardless, the PowerWatch 2 is a marvelous device, even if its software looks functional yet unremarkable at first glance. It costs a pretty penny, but what price would you pay to never have to charge your smartwatch again?